The RhinoBlock is designed to help improve your accuracy so you can enjoy more success out in the field. It can easily stop different types of field points without losing its shape and it won’t damage your practice arrows when you are pulling them free from the foam block. The targets are easily visible at a distance, and it even comes with 3D images that will also help improve accuracy. It is also incredibly easy to hang so you can immediately start practicing your archery skills. Even though this block target typically receives high ratings from consumers it should be noted that not all of the inserts are replaceable. This is usually not an issue due to the “self healing” foam used in construction, but it is something that frequent users might want to consider. This block target from Rinehart can be used with broadheads, field points and even expandable tips without losing any of its integrity. The 6 sided cube will retain its shape through hours of practice, thanks to Rinehart’s innovative “self healing” foam. This allows you to take repeated shots without damaging the target. You will also appreciate how easy it is to remove your arrows from the target without ripping the foam or damaging the tips. The RhinoBlock is designed to improve arrow placement and accuracy. 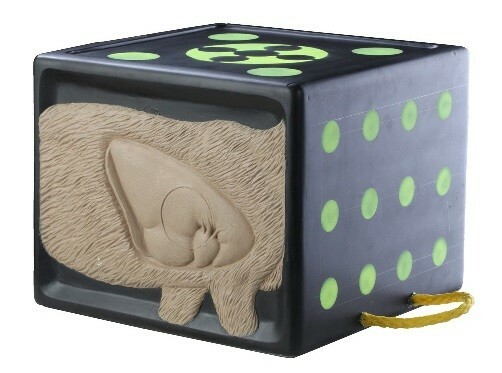 The 6 sided cube comes with large and small targets, along with 3D images of a deer’s vital organs. The large targets are designed to improve your aim, while the smaller ones will help you work on placing the arrows exactly where you want. This will help you achieve higher scores at archery tournaments or make your next hunt a success. Hunters can also take advantage of the 3D graphics found on two sides of the target, which are designed to help them make accurate and humane killing shots. With 40 target zones all highly visible you can work on improving all of your skills with a bow and arrow. With the RhinoBlock from Rinehart there are not any complicated directions to follow for assembly, and everything is included with your purchase. The durable target comes with a rope handle so you can easily carry it to and from the practice field, and the mounting holes allow you to hang it from a branch or pole at the desired elevation. SInce the 40 targets are clearly visible you can easily work on distance shots and the RhinoBlock also comes with an additional insert for the circle targets so you can easily replace the foam when needed. While the insert for the large and small targets is removeable, the one for the 3D graphics is not replaceable. If you are looking for a durable target to help you improve aim, accuracy and arrow placement, the RhinoBlock might be just what you need. The six sided cube comes with large and small targets that are designed to help you hit exactly what you are aiming for. To help hunters know exactly where to place their arrows there are 3D images depicting the vital organs of large game animals, and you will love the “self healing” foam construction that allows you to fire repeatedly at the target.